The Adventues and Memoirs of Sherlock Holmes, by Sir Arthur Conan Doyle, turns out to be two (originally separate) collections published together. I needed to pick a mystery or thriller for the Mixing It Up challenge. I'd read The Hound of the Baskervilles eons ago, but never any of the short-story "cases," so I thought I'd try one of the Holmes collections. It's interesting for an avid Agatha Christie fan like myself to read Sherlock Holmes stories. That is to say, it's interesting to find out just how much Christie owed to Conan Doyle. Poirot and Hastings are patterned on Holmes and Watson, of course; I knew that already. The great detective shares bachelor quarters with his war-veteran friend, who chronicles his cases. What I didn't know was that Holmes gave Poirot many of his personality traits and detective methods, too. Let's compare. Both detectives are: lifelong bachelors who admire only one woman (a criminal who got away); wealthy enough to pick only those cases that are interesting enough to be tempting, but kind enough to take a case for a client in distress; given to mentally solving a case almost immediately, but keeping the solution secret till the dramatic ending; fond of telling Watson/Hastings to use his brain, that the same facts are available to both of them. The one big difference between the two detectives is so often harped upon by Poirot that it amounts to an homage to Holmes: Poirot, at least once in every book, proudly insists that he does not crawl about in the mud, looking for cigarette ends or burnt matches. He leaves that to the police, preferring to sit in a comfortable armchair and exercise the little gray cells of his brain. Holmes, on the other hand, eagerly examines footprints, match ends buried in mud, and the soles of suspects' boots. I don't think less of Christie after learning how much she lifted from Conan Doyle. I enjoy her books not because they're great literature (they're not), but for the ingeniousness of the puzzles, and the picture of a time and place--England between the wars. Her ear for dialogue is particularly wonderful. The Sherlock Holmes stories offer not only better-quality writing, but great puzzles in another interesting setting (gaslight-era London). It's been so long since I've read a Poirot book that most of these similarities have not stood out to me as I've been reading Holmes. Thanks for pointing them out! I'll definitely keep my eye out for them when I read more Poirot. Both authors are great fun to read, and it's always interesting to find connections. Have read the first novel about Sherlock Holmes, A Study in Scarlet and really enjoyed it, look forward to reading the rest as I've popped them on my classics club list. Christie was part of my growing up--I read her books repeatedly in my teens and twenties, and I can practically recite them now. They were my comfort reading. 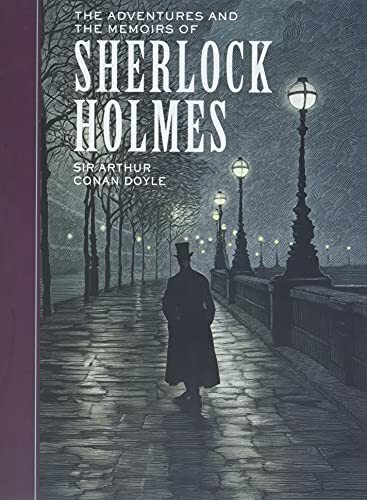 So although I haven't read one in many years, the parallels immediately struck me when I started reading the Holmes stories. Enjoy your Holmes! I prefer Agatha Christie, because Poirot uses his psychological skill besides analysis and deduction, while Holmes focuses on the analysis & deduction. That's why, I think, Agatha Christie's books are much more emotional than Holmes. That's a really good point--Christie was more interested in human nature and psychology. That shows even more in the Marple books. Miss Marple was always saying things like "He reminds me of so-and-so, who would always..." or "She's just like so-and-so, who left had an affair with the milkman..." But Poirot, as well, always emphasized "the psychology."